Shannon Gullberg was born in Edmonton, Alberta, Canada and was raised in rural Alberta. Shannon obtained her law degree from the University of Alberta in 1988 and immediately came North to article and remained in private practice for several years. From 1991 - 1995, she worked for Legal Division, GNWT, where her primary responsibilities were to provide legal advice to the Department of Health and the Department of Social Services. Shannon started her own practice in 1995, with her focus being on child protection and administrative law. She then became legal counsel for the Languages Commissioner from 1996 - 2000. As well, over the years she has also conducted many high profile investigations for the Legislative Assembly and various Ministers. Shannon was asked to take over the position of Languages Commissioner in 2005, which she did until early 2008. 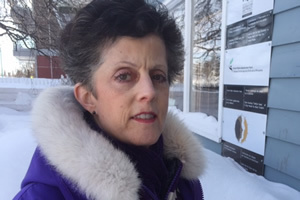 Shannon was again asked to take over the position in an Acting Capacity in 2015 and was appointed by the Legislative Assembly as Languages Commissioner in October 2015 for a four-year term. Shannon was also appointed as a Special Languages Commissioner in 2014 to handle one specific complaint. In 1983, Shannon obtained a Bachelor of Science degree in Rehabilitation Medicine (with distinction) from the University of Alberta in 1983. She went on to practice as a speech pathologist for several years before attending law school. This focus on communication has always been a passion. The Official Languages Act applies to all institutions of the Legislative Assembly and GNWT departments, corporations, boards and agencies. The Act does not apply to municipal governments or private industry. The Languages Commissioner can investigate any allegation that the Official Languages Act has been violated. The Languages Commissioner can also initiate an investigation in the absence of a complaint. Following an investigation, the Languages Commissioner can make recommendations to the Deputy Head of the department or agency in question. The Languages Commissioner can report the matter to the Legislative Assembly if a government department or agency does not respond to the recommendations, or if the Languages Commissioner feels the government department or agency has not taken adequate steps to address the issues in question.